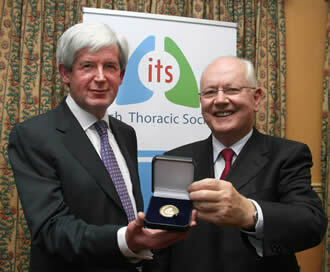 A special feature of the Irish Thoracic Society Annual Scientific Meeting 2009 was the presentation to Professor Muiris X FitzGerald of the inaugural Irish Thoracic Society Award for Outstanding Contribution to Respiratory Medicine. This proved a wonderful opportunity to celebrate and recognise Professor FitzGerald’s distinguished career and his unique and invaluable contribution to the field of respiratory medicine. 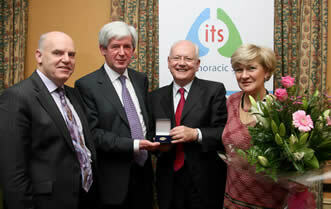 Professor Charles Gallagher presents the Irish Thoracic Society Award for Outstanding Contribution to Respiratory Medicine to Professor Muiris X FitzGerald.